Designed with Grammy-winning mixer Andrew Scheps (Adele, Jay Z, Metallica), this flexible channel strip delivers Andrew’s time-tested combinations of compression, EQ, saturation colors and more – all crafted to work together beautifully and cohesively. Channel strips are the mixing world’s most efficient tools, providing all your basic processing – EQ, compression, gating, and often more – in one modular, easy-to-manage unit. Mixers choosing which channel strip to work with often face a dilemma, however: Channel strip plugins based on vintage mixing consoles can sound amazing, but tend to tie you down to a very specific and limited sonic color. Modular channel strip plugins let you mix and match diverse processors with flexibility, but the different processors might not work together cohesively and won’t necessarily interact as a true channel strip. The Pre module provides three types of analog saturation, letting you add diverse colors of harmonic distortion as well as filters and thump (resonance) controls. 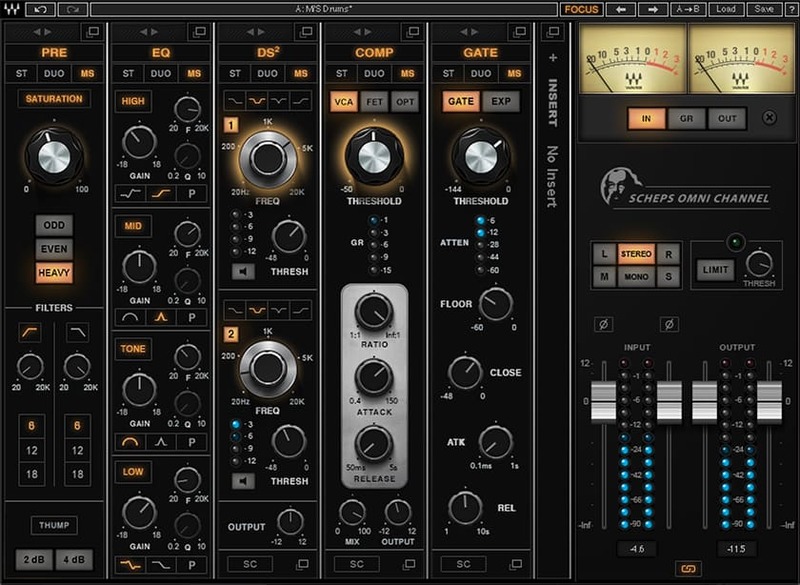 The Compression module features 3 completely different compressors ranging from fast to slow and smooth, with a unified control set so you can quickly compare them. A Wet/Dry control allows you to parallel compress within the module. The EQ module is a 4-band equalizer; each band providing a distinct musical sound that holds up on its own or can be switched to fully parametric if surgical EQ is required. The DS2 module is so much more than a de-esser, with two full-range bands and four filter types allowing it to ‘de-anything’ – remove any offending frequencies, not just S’s or T’s. If that’s not enough, Scheps Omni Channel features an insert slot that can be positioned anywhere in the chain, where you can insert an additional Waves plugin of your choice, including an extra instance of any of the Scheps Omni Channel modules. For live sound, Scheps Omni Channel offers zero latency and full discrete control over each stereo channel. Select controls of the compressor, EQ and filters are mapped conveniently to the eMotion LV1 live mixing console, serving as the console’s channel strip. Finally, you get a set of ‘Focus’ presets, created for different sources, which highlight the most important controls you should be focusing on to achieve your current task. No matter what musical genre you are working with, Scheps Omni Channel will help you stay focused while you mix, quickly audition sonic characters with just a few clicks, customize your signal flow easily in one interface, and be confident that the sounds you fashion ‘sit’ together beautifully and cohesively.